8,200 m2 façade, of which 3,750 m2 MFree-SCCF with automated venetian blinds integrated into the cavity of the UCLH Building in London, England. In response to clients' demands for highly transparent yet energy efficient, cost-effective, and durable façades, Permasteelisa Group developed a dynamic closed-cavity façade system known as MFree-S+ facade (Moisture-Maintenance Free Sustainable façade). The system offers many of the benefits of a double-skin façade: a shading device protected in a cavity which modulates solar heat gain and is controlled by the BMS. However, as a unitized system, it is completely assembled in a factory with high quality control. There is no catwalk required for maintenance access, and the useable floor area is thereby increased (the depth of the cavity is not larger than the framing depth needed for structural wind loads). Maintenance costs are also reduced with just two surfaces to clean—the same as a conventional single-skin façade—instead of four. The durability and life-expectancy is easily tripled (e.g. higher than 80 years). Installation of façade panels can be carried out in a single operation instead of installing each skin plus the catwalk individually. This reduces cost and accelerates construction speed. The MFree-S+ system is well suited for commercial office buildings which seek a highly transparent building envelope while delivering high thermal, acoustic, and daylight comfort combined with exceptional energy performance. It is also well suited for buildings where low maintenance and high user comfort are a priority, such as in hospitals and laboratories. The system was developed by research carried out by Permasteelisa Group and university laboratories in Europe. Advances in façade technology in the form of double-skin façades (DSFs) have improved the energy efficiency of buildings in recent decades. DSFs offer a highly insulating building envelope with improved occupant comfort, an abundance of daylight, and good acoustic performance. Permasteelisa Group has designed, fabricated, and installed many of them in the past 30 years. To address these factors, the Permasteelisa Group and their research partners developed a new dynamic façade system, known as MFree-S+ closed-cavity façade. Components of the system are shown in the exploded axonometric below. The system is comprised of unitized panels with a depth of 6 to 8 inches, similar to a standard double-glazed unit (DGU). Blinds are protected in the cavity, and a low-pressure supply of dry, clean air prevents condensation and dust. This provides the thermal advantage of an exterior operable shading device without the high maintenance costs. Because the system is completely closed, it can be installed in the same manner as a Single Skin Façade (SSF). Additionally the edge seal of the inner double-glazed unit (DGU) is in protected position, ensuring a significant extension of the life time of the DGU and thus reduction of the long-term costs and high credits in sustainability and environmental rating systems. The shading controls are programmed by an intelligent building management software, which has several benefits: the façade can communicate with the HVAC system, the panels can be reprogrammed to account for changes in shading conditions (e.g. a new building adjacent), and one wall type can be used for all elevations and exposures, reducing cost and complexity and providing a uniform appearance. The most significant benefits of MFree-S+ closed-cavity façade (CCF) are the potential energy savings due to the extremely low U-value and solar heat gain. As a unitized system, the MFree-S+ is easily adapted to various buildings. The technology can be applied on nearly any shape or size glass, cavity depths, blind types, glass coatings, etc. Transparent façades (which typically have higher solar gain, lower thermal performance, poor acoustics, low comfort, and limited durability) have now been innovated to the highest positive impact on occupant comfort and environmental performances. The innovative MFreeS+ façade was realized with the development of sophisticated dynamic assessment tools for detailed performance prediction, high level research, and accelerated long-term performance testing of closed cavity façades with control systems. The MFree-S+ closed-cavity façade promotes energy conservation and carbon emission reduction through a very low U-value and controllable solar heat gain. The application of the MFreeS+ façade on different buildings has resulted in the nomination of the highest environmental rating and life-cycle achievements in different countries in the world where these aspects are among the most stringent in the world (Switzerland, Germany, Switzerland, Australia). 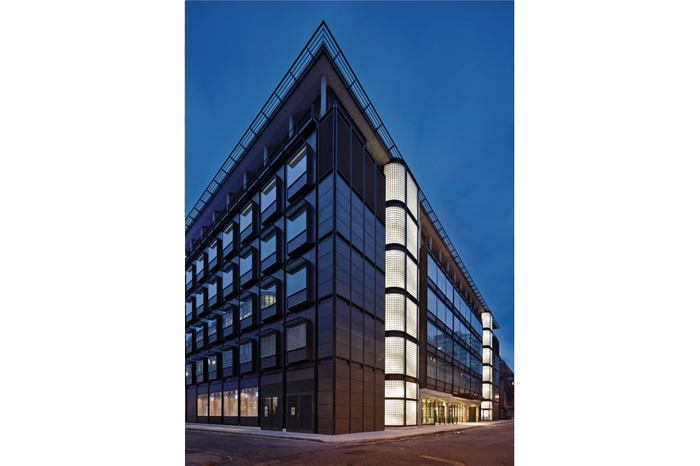 The façade of Roche Building 1 in Basel, Switzerland has a 8,200m2 façade, of which 3,750m2 is MFree-SCCF with automated venetian blinds integrated into the cavity. With a BMS-controlled shading device protected by the glazing, this system can work in conjunction with the HVAC system to maintain comfort sustainably and also provide daylight control. On a project level, the MFree-S+ façade brings resiliency in the form of life-cycle improvements by extending the life expectancy of the building envelope from 25 years to 80 years. On a community level, the ability of this system to adapt to changing environmental conditions reduces CO2 emission from buildings, uses less natural resources, and results in satisfied and productive occupants. This results in the compliance with the highest performance targets specified by clients and the most stringent regulations in the world. The MFree-S+ façade has an unprecedented synergy of the highest performance requirements (which typically conflicts when traditional façade systems are used): transparency, low energy consumption, high comfort (thermal, acoustic, visual), improved life span, and reduced maintenance and repair costs. Several presentations and papers were presented in international conferences and environmental workshops which are listed below. BIM tools are widely used in the design of MFree-S+ façades (thermal, structural, solar, and energy assessments, shading assessments of adjacent buildings for setting algorithms of blind controls systems).